I’m all about anything fragrant. I think it adds another dimension to life. That’s why I’ve decided to open this forum up a bit. Friends of mine, who have been reading my chronicles here, have suggested talking things other than colognes. 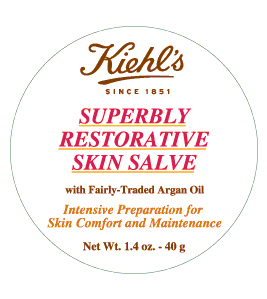 I thought about it, but knew the moment I smelled Kiehl’s Superbly Restorative Argan Skin Salve, that I had to. It’s blended with Cedarwood, Orange, Patchouli, and Eucalyptus oils for a very fragrant yet manly appeal. Almost exclusively found in Morocco, Argan Oil comes from nuts produced by the argan tree. It contains essential fatty acids, is high in Vitamin E (those of us who have dry skin know vitamin E is one of our best friends) and is said to have age-defying effects. It can be used on your skin, nails and hair. The makeup artist told me it would give my hair a smooth appearance and tame fly aways. Fly aways I don’t have to worry about but adding another layer of smell good to my being is what made the $25 purchase at Kiehl’s worth every penny. To learn more about this product and the women cooperatives that make it, check out this section of the Kiehl’s website and a story from the New York Times T Magazine. This entry was posted in Product review and tagged Argan nuts, Argan Oil, Argan Tree, Kiehl's. Bookmark the permalink. Love Argan Oil, yum! Nice tip B, thanks!